What is a dashboard and how do I create a new one? In this section, you can decide which survey results are important to you and which aren't by creating personalised dashboards. Either create one for each feedback form or combine various forms on one dashboard. How do I create a new dashboard? First click on "Add dashboard" (top right). 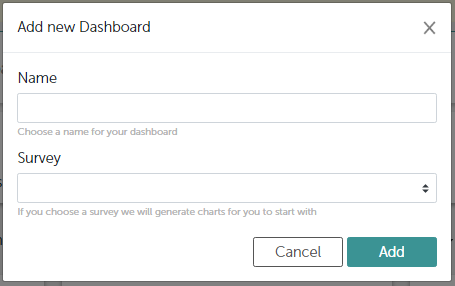 A window will appear where you can give the dashboard a name and choose which survey to use as its information source. Next, charts will automatically be created from the feedback form and will appear in exactly the same order as the questions there. To find out how to edit an existing dashboard, click here.